After decades as vice president of sales at rising Silicon Valley tech companies, Scott Davis could finally see beyond the numbers. He learned to spot signs of sales reps “leaning forward in the saddle,” giving sales managers optimistic odds of closing faraway deals. He could look deeply into each deal and know exactly where sales reps were missing the mark. A few years ago, the company he was with decided to bring in artificial intelligence-powered (AI) sales forecasting software from vendor Clari. It wasn’t very accurate, Davis says. But AI is driven by machine learning, which means the software trains on data and becomes better over time. Over the next five years, Davis watched it start beating him to the punch. Today, Davis is an adviser to startups, and practically demands they become Clari customers. Sales-forecasting software vendors like Clari are playing a big role in ushering AI into the enterprise. The software moves the proverbial needle: better forecasting and higher deal-closing rates. Even traditional customer relationship management (CRM) integrators are reinventing themselves as AI experts. AI-powered sales forecasting software promises to solve a company’s biggest problem. Clari polled more than 300 customers last year and found that less than 14 percent of sales reps achieve greater than 70 percent of their quota. Sales reps, of course, make up the most expensive labor pool in a company. When the sales forecast is wrong, everyone feels it. AI-powered sales forecasting software gathers data about past deals. It looks at data signals, such as emails, meetings, even phone calls, and analyzes how they relate to sales outcomes. InsideSales.com’s AI-powered sales software, called Neuralytics, also adds contextual data such as weather, traffic and sports into the sales forecast. Then insights from the data are applied to the current pipeline, and the software scores deals, provides visibility into them, and even advises sales reps on next actions to take. Sales managers can know, for instance, how many times a sales rep has contacted someone. The best AI-powered sales-forecasting software goes back and reconciles scoring accuracy rates, thus learning from failures and successes. The upshot is nothing short of game-changing. In the Clari poll, 93 percent of respondents said they experienced improved forecast accuracy and 60 percent achieved increased close rates. Dana Therrien, practice leader of sales operations strategies at SiriusDecisions, a research and advisory firm, says he’s still waiting to see an objective rating on vendor results, but what he’s hearing from clients has made him a believer. The road to AI-powered sales forecasting software began, somewhat ironically, in marketing. In enterprise technology innovation, marketing tech leads the way. There are more than 3,500 marketing tech products on the market today. At the heart of marketing tech is the marketing automation platform, which has been doing AI-powered lead scoring for years. The problem, Therrien says, is that two-thirds of the sales funnel is built through generated leads, not marketing. This means there’s no lead scoring on the majority of deals. That AI-powered lead scoring was happening in marketing exposed the fact that it was a blind spot in sales. In the fall of 2016, Salesforce unveiled Einstein, its AI engine. Einstein does everything from classifying images to structuring data to scoring leads. Einstein’s deep-learning technology extracts signals from, say, a sales rep’s email to inform next steps in the sales process, Marco Casalaina, vice president of products for Salesforce Einstein, told Channel Futures last December. At Dreamforce the month prior, Einstein had taken center stage. Training sessions were jampacked. Given its celebrity status in the enterprise tech world, Einstein raised the profiles of other AI-powered sales forecasting software vendors, such as Clari, InsideSales.com, SalesLoft, Aviso and Outreach. Judging from activity over the last few quarters, the market is starting to heat up again. Therrien advises five vendors in the market, and all five have reported record quarters within the last year. Case in point: In 2017, Clari tripled its customer base, adding Adobe, Airbus DS, Audi, GE, PerkinElmer and others. Large systems integrators, such as Accenture and IBM’s Bluewolf, continue to push the messaging that Einstein is the AI engine for everything that touches the sales force automation platform, Therrien says. But he’s not convinced this is the right strategy, and neither are smaller channel companies. AI engines like Einstein are good at sales forecasting once they have the data signals, but not so good at getting sales reps to input the data, Therrien says. It’s a critical distinction; without this data, AI can’t do its job. Too often, the data is lacking. Sales reps notoriously delay putting a deal opportunity into a sales force automation system, because they don’t want sales managers learning about it and constantly asking what they’ve done to move it along. “There’s a disincentive in the Old World to provide information because you get unwanted inspection,” Therrien says. With AI, though, there’s quid pro quo at work. If a sales rep inputs and updates opportunities in the AI-powered sales forecasting software, the software will give the sales rep suggestions on next best steps that have helped close similar deals. Whether you’re looking at Salesforce Einstein or other AI-powered sales forecasting software, a systems integrator can help on two fronts: integrating it into multiple systems, such as the sales force automation platform, configure price quote, contract lifecycle management, outbound dialer, and inside sales management, as well as optimizing the software to deliver the best results. AI-powered sales forecasting software vendors know this too, which is why many have begun standing up channel programs. Today, 90 percent of InsideSales.com’s sales are direct, but “you’ll see us engage much, much more with channel partners,” InsideSales.com CEO Dave Elkington told Channel Futures in January. Clari, too, is on a channel binge. In the next three years, CEO Byrne expects to see 40 percent of sales flowing through the channel. What does an AI channel expert look like? Just ask Red Sky Solutions. Stone says his company doesn’t need to know how AI works from a data scientist’s perspective, rather how to glean the best insights from data. An AI channel expert has to be able to set up a sales force system in a way that maximizes the results of the AI-powered sales forecasting software. Red Sky Solutions also has to convince a company’s VP of sales operations to buy AI-powered sales forecasting software — and it’s not as easy as you might think. While the cost of the software is reasonable, especially when weighed against the returns, AI is new and a little scary. Companies tend to be conservative when it comes to touching their sales organization. 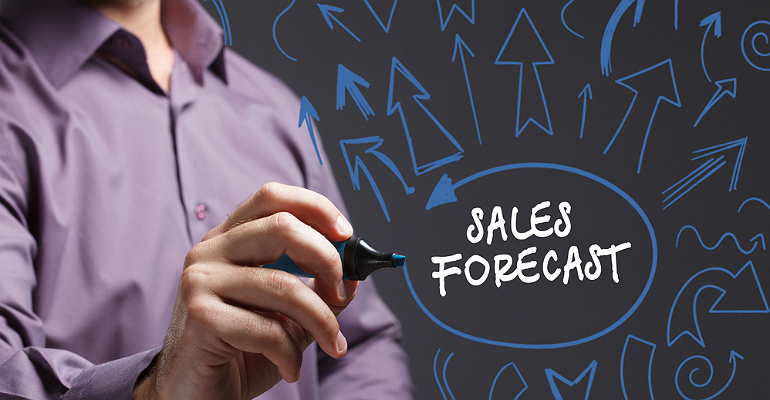 A breakdown in sales forecasting can be disastrous. Sales operations leaders will have to carve out time to study the technology’s benefits and get over their fears. What Happens to the Sales Rep? Even experts don’t really understand how AI-powered sales forecasting software will impact sales culture down the road. Therrien was talking to data scientists about the effect AI might have on the sales profession in ways that aren’t readily apparent. While AI-powered sales forecasting software does a good job identifying the best opportunities, it’s not good at predicting outliers. The data scientists wondered: If the software tells the sales rep that there’s little hope for a particular opportunity, will this discourage the sales rep? For now, AI-powered sales forecasting software helps remove all that’s wrong with human intuition. It guides sales reps with data-proven next steps for closing deals. It gives sales managers real visibility into deal flow so that they don’t have to rely on a sales rep’s shaky narrative. And it greatly improves sales forecasting by taking human error out of the equation. “It’s getting to the point where it’s better than anyone’s gut,” says Davis, the sales veteran.